From time to time, it becomes necessary for me to send out eviction notices to large hunks of meat taking up prime real estate in my freezer. This generally happens when I'm in the mood to make dumplings and ramen broth (any time-consuming food process should be done in large quantities in my opinion), but especially when the holidays roll around and I need the space to store Christmas cookies. I've had a hunk of pig lounging languidly for some time now, thanks to my hunter buddy Ron Colby. Our mutual boss has a ranch in Texas that is inundated with fresh, wild hog and he goes frequently to help keep the population down. That means he comes home with freshly butchered young pig and if you've only been eating the factory-farmed kind, you've been driving past flavor-town, my friend. I suppose I'm a bit spoiled - heritage breed pigs are all the rage right now but it takes money to produce a healthy hog with lots of flavor. Money well spent in my opinion, and I'm all for sourcing those kinds of excellent pigs. I just happen to be lucky enough to get a few for next to nothing because someone else's freezer is overflowing. Trickle down effect in action! If you are lucky enough to get these wild pigs, you'll need to know that the meat can be a bit leaner than those chunky heritage breeds - they're not fed on a regular basis by loving farmers, they're free range and wide roaming. In other words, they're perfect candidates for low-and-slow methods of cooking. In this case, the big bone-in pork shoulder I had thawing was headed for a lengthy braise at low heat in a crockpot full of Mexican flavors. I researched many recipes for slowcooker carnitas and found several I liked well enough to morph into the recipe below. 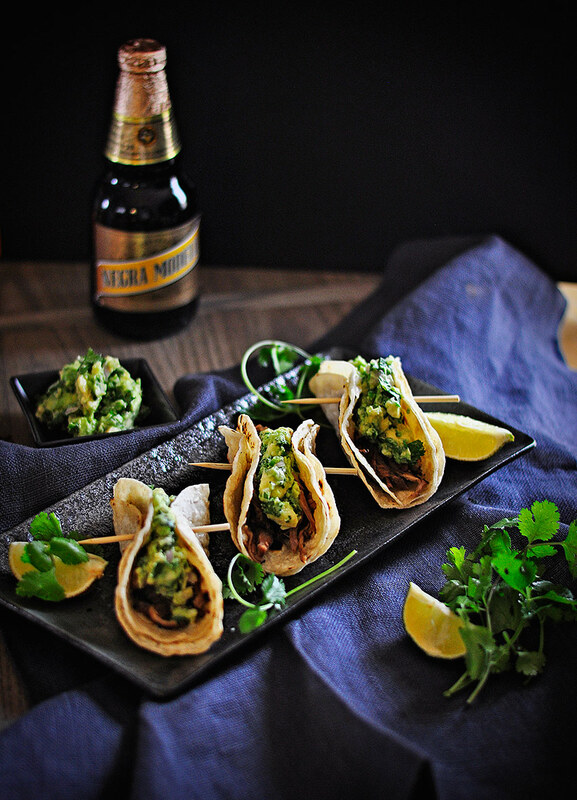 None of them called for adding beer, but I'd recently been contacted by Negra Modelo, an imported Mexican beer that is "muy" complimentary with food, specifically food fueled with Mexican flavors! I knew adding orange juice would help tenderize the lean pork, but I wanted to add some moisture that would deepen the already sturdy flavors of the free-range meat. The timing couldn't have been better! Negra Modelo's marketing team sent me some handy tips on how to compliment my cooking with their beer, and while they couldn't send samples of the actual beer, they did send a lovely tasting kit that included two beautiful Tulip beer glasses, as well as a box of four Butcher's Spice Rubs - and I was happy to rub a bit of the Bicentennial Seasoning on the pork before I put it gently to bed in the crock pot. Carnitas is such an easy dish to make - it requires little effort but rewards your patience for it's long-cooking time with tender, tasty pork. You end up with mounds of tender meat and while you could totally stop there and serve it simply with the juices spooned over the top, I encourage you to go one step further and crisp the cooked meat in a skillet with a little bit of fat. I really puts the dish over the top. Use the meat in a Mexcian dish of your choice, such as tacos, tamales, burritos and even rice bowls. I was craving tacos, so I whipped up some guacamole, tossed some corn tortillas on my plancha (cast-iron griddle) and we were in business. 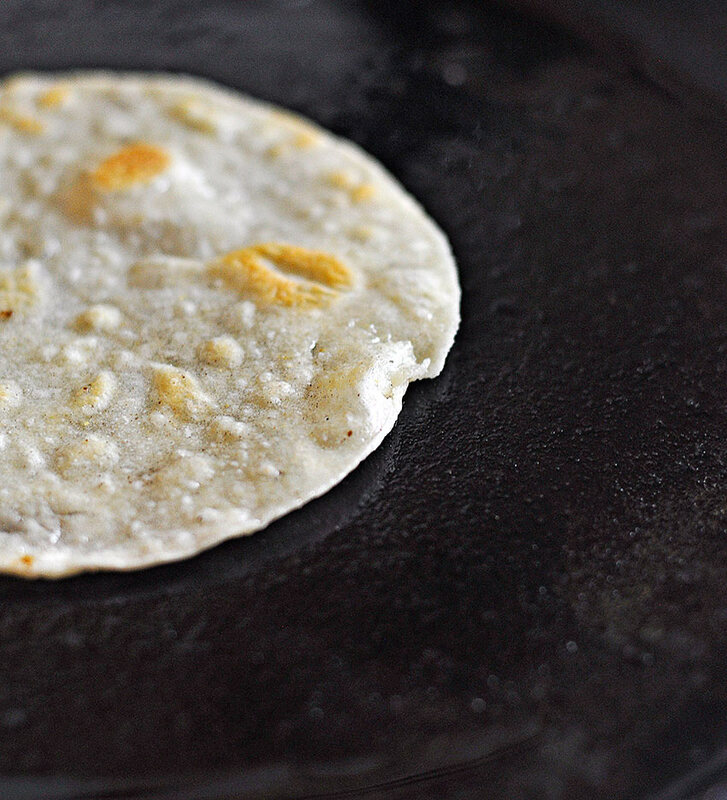 I love to grill my corn tortillas before serving - it's a fast way to heat them through, and I love the charred flavor I get from letting them puff up on the plancha. I'm including my recipe both for the pork carnitas as well as the guacamole. The meat is so flavorful in this dish, I really didn't want to add much more than the guacamole, but feel free to doctor yours up with your favorite salsa of choice or some queso cheese. Mix all the ingredients in a bowl, smashing gently with a fork to incorporate the avocados with the remaining ingredients. Rinse and dry your pork shoulder and rub the salt and pepper into the meat. Combine the rub ingredients and rub all over the shoulder. Place the shoulder in the slowcooker and top with the onion, jalapeno pepper, garlic, the juice of the orange, and the bottle of Negra Modelo beer. Cook on low for 8-10 hours, or on high for 6 hours. If you are using a lean pig, I recommend going with the longer, slower method. The meat should be tender and falling off the bone when it's ready. Remove the shoulder from the slowcooker and shred it with two forks. Skim and discard any fat that is floating on the surface of the cooking liquid. If you have more than 2 cups of liquid remaining, reduce it either in the slow cooker or in a saucepan and set aside. Heat 1 tbsp of oil in a well-seasoned pan (I recommend a well-seasoned cast-iron skillet - I personally love my De Buyer Blue Steel pan) over high heat. 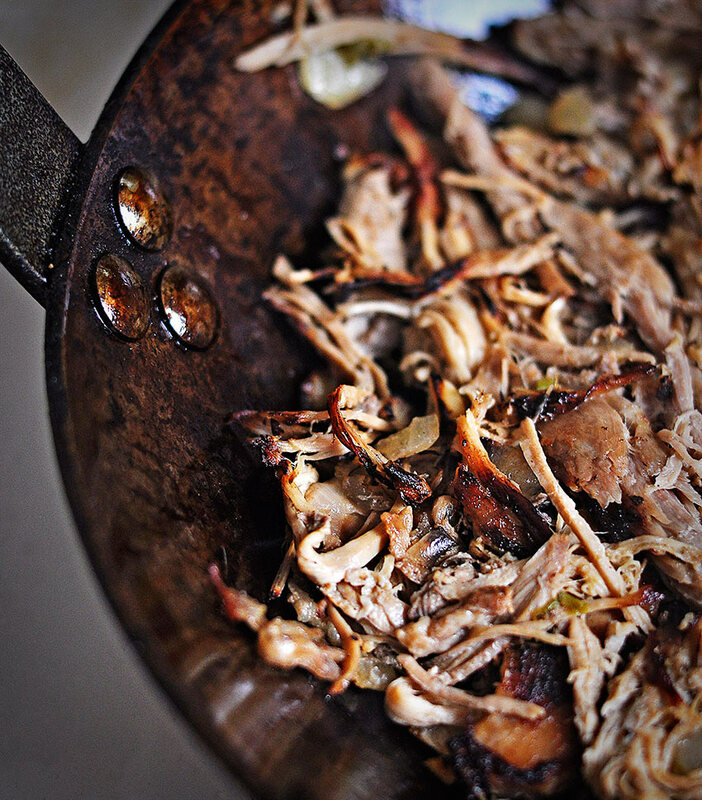 Place the shredded pork in a single layer in the pan and press down on the meat to develop a golden crust.